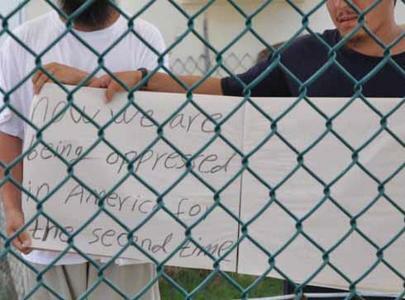 A protest sign held by two Uighur prisoners at Guantanamo. As mentioned in yesterday’s “experiments with truth,” a number of the 17 Uighur prisoners in Guantanamo staged an impromptu protest for visiting journalists with signs that demanded their freedom. There was some doubt as to whether any of the photos taken would be cleared by the Department of Defense. But it appears as though at least one made it through. The military seemed to consider the occasion a good PR opportunity. ”As you can see, they are pretty much free men,” said a Navy chief who supervises sailors guarding the men at the half-acre compound. He called the protest ”their own doing,” and permitted a dozen reporters visiting the prison to film the signs. It’s hard to imagine calling anyone who’s been in Guantanamo for seven years a free man. Just hours after that Navy chief spoke to reporters, a non-Uighur prisoner in another part of the Gitmo complex committed suicide. It was the first suicide at the detention center since Obama took office.